The regulator slashed the rate by 100 basis points to 14 percent from 15 percent, which comes as some relief for business which has been lobbying for lower borrowing costs. The Central Bank said Russia’s weak economy is quelling inflation on its own. “The balance of risks is still biased towards a significant slowdown of the economy,” the regulator said after the decision was publishedon Friday, March 13. "According to Bank of Russia forecast, the current monetary policy and low economic activity will be conducive to the slowing of annual consumer price growth to 9% over the year (March 2016 on March 2015) and to the target of 4% in 2017. As inflation risks abate, the Bank of Russia will be ready to continue cutting the key rate,"the CBR said. Cutting the rate appeals to the pro-business lobby in Moscow which has been pushing for lower rates so businesses can continue to grow and develop, which they argued was impossible when the rate was 17 percent. On Wednesday, Andrey Kostin, CEO of Russia’s second biggest bank VTB, called for the Central Bank to lower the main rate by at least 100 basis points. The CBR’s decision would relieve the strain put on Russian banks by Western sanctions which cut off access to a long-term financing. It is “indicating that the worst is behind. Further monetary easing will allow Russian banks to improve their financials in the next few months,” Aleksandr Prosviryakov, Treasuries & commodities manager at PWC,told RT. Consumer prices have been rising as the ruble has been falling. The currency has lost more than 45 percent of its value in 2014. In January, the bank unexpectedly slashed its interest rate to 15 percent from 17 percent. In December, the interest rate was hiked to 17 percent in an attempt to stop speculations on the ruble and cap inflation. The 6.5 percent increase, which took most by surprise, was the sharpest rate increase since the 1998 crisis, when lending rates exceeded 100 percent. In November, the Central Bank allowed the ruble to free-float about two months ahead of schedule. 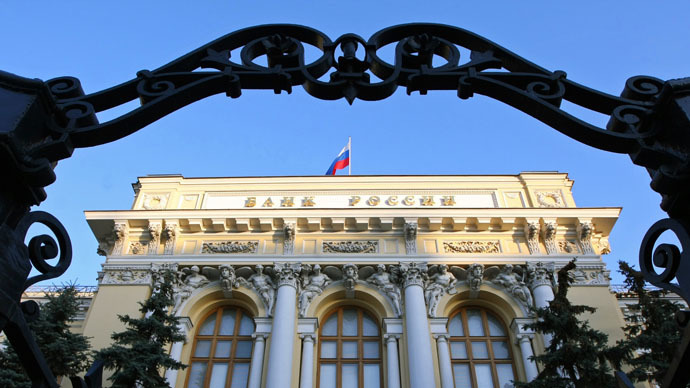 Economists expect the Russian Central Bank to continue cutting rates this year and return close to the 11.5 percent it was before being hiked to 17 percent to stem the ruble crisis. At the beginning of 2014, the benchmark interest rate was 5.5 percent. Central banks use interest rates to control money flow by making it more or less expensive for people and businesses to borrow from banks. In 2014, Russia increased its interest rate to combat inflation, but by 2015, the regulator decided to loosen its grip to jump start business. Several Russian firms have been placed under sanctions by the US and EU which no longer allows them to borrow from Western banks. January’s rate decision was also supposedly motivated by business interests, and Rusal, Russia’s largest steel producer, publicly asked the bank to lower the main rate. Weak oil prices, sanctions, and the geopolitical conflict in Ukraine continue to weigh heavily on Russian growth. Gross domestic product in Russia is set to fall by 3.5-4 percent in 2015, according to the Central Bank. In 2014, the economy expanded by 0.5 percent. These forecasts are based on the scenario that economic sanctions against Russia will be lifted in July 2015. More than 50 percent of the Russian budget is dependent on revenue from oil and gas, which is threatened by lower oil prices and production.